The kickoff of the Saint-Hubert library, long expected by the Hubertins and their city officials, was finally realized in September 2007 following the announcement of 4.4 million dollars of financial aid by the Ministry of Culture, Communications and Status of Women. 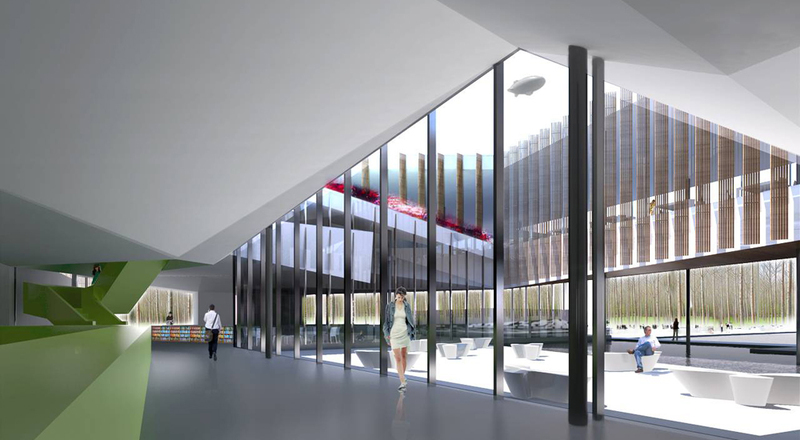 With close to 4000 m2, this equipment will become, at its completion, the main library within the territory of the city of Longueil. Rooted in the Parc de la Cité, a very popular place among citizens, the library will not only benefit from a green space but will also become the meeting point of the park. Consequently, it will establish itself within the existing management plans of the park, to create a new institutional focal point for the district, in addition to the already installed CLSC, two secondary schools and the police station. To make “an innovative project, which is inventive, positions itself on the various environmental choices such as the selection of materials, the planning of facilities, the effective management of water and air quality” the promoter launched on September 8, 2008, a call for candidates from members of the Ordre des architectes du Québec from which, on the following October 3rd, three teams were selected as finalists: Saucier + Perrotte architects, Manon Asselin architect in association with Jodoin Lamarre Pratte & Associated Architects and acd f * architecture_urbanisme_intérieur. The selection of the winning team, after jury deliberations and recommendations from a technical committee, ended with the proposal of the consortium formed by Manon Asselin, Architect and Jodoin Lamarre Pratte & Associates Architects. The building, an off-center square and hollow at its center, is modulated with facades that orchestrate with the functional interior plan and subtly chosen points of view, to enrich the user's experience. The irregular plan, gives an impression of openness and diversity of spatial experiences. The shape of the building which "ripples and floats" lightly above the ground like a "flying carpet" (a topic highlighted in introduction by the architects) is supported by a skirt that flows in accordance with the alternating solids and voids, from which access to the building emerges. The jury appreciated the particular attention given to readers and the places that were dedicated to reading. They also were sensitive to the efforts regarding the implementation of an aggressive monitoring of the environment and of the "subtleties suggested by the treatment of the envelope" especially those of green roofs where parts were cleverly folded to flood the central terrace with light and nourish a pond of storm water. Saucier + Perrotte for their part have designed a rectangular building, which invokes the sky by an illuminated appendix which flows from its dark mass. An effort of imagination which nevertheless left the jury sceptical regarding its feasibility and its semantic argument. While embedded within the mass of vegetation, the library wrapped in reflective material, dissolves into the green. Paradoxically, the jury concluded that the general tonality did not respond to the “bucolic context of the Parc de la Cité”. The proposition of acd f*, despite its obvious merits, left the jury in a state of great perplexity. Even if a "strong presence" was desired, the building was seen as an embarrassing presence, rather than an invitation to visit the park, in contrast to the architects' intentions. The plan of the building, despite its functionalist rigour, includes various areas such as the "tree house" which were favourably met by members of the jury. The treatment of the facades and the modulation of the ceilings which were derived from the fragmentation of the volume-concept, were particularly successful, but the disposition of the reading and working rooms along the sides and oriented directly south seemed problematic. On the ground floor, the duplication of the lobby did not ultimately convince the jury of its usability. To be continued... This past September 18th, acd f * architecture was selected among 28 candidates with three other finalists, for the St. Lawrence library competition. Similarly, Manon Asselin in association with Jodoin Lamarre Pratte architects will participate in the final phase of the Marc Favreau library competition in the Rosemont-La Petite-Patrie district against three other teams. In September 2007, with the announcement of a major financial assistance of 4 400 000$ from the ministère de la Culture, des Communications et de la Condition féminine (MCCCF), the city of Longueuil announces the Saint-Hubert library competition. This competition is open to all Quebec architects (members of l'Ordre des architectes du Québec, OAQ) were invited to submit an expression of interest to participate in this design competition. From that stage, three finalists were asked to make a proposition. The project will be in the heart of the district at the North-East entrance of the Parc de la Cité which is renowned for its lake and vast fields. Because of its location, the establishment will benefit from what the park has to offer and serve as a gateway. With its 3957m ² and an initial budget of 11 600 000$, the Saint-Hubert library will be the first major cultural building of the district. This project will solve the lack of space of the city's libraries and increase the service quality for the user. In this sense, it is important to make an urban building, visible from the Boulevard Cousineau, one of the most important of the city. In 2005, the city of Longueuil adopted a conservation and management plan for natural environments and Parc de la Cité is one of these protected areas. The project should be innovative, inventive and make a statement through different environmental choices such as the selection of materials, the landscaping, the efficient grey water management as well as the air quality.